Over half of the funding that comes out of Europe is channelled through the ESI funds. They are jointly managed by the European Commission (EC) and the EU countries. In Wales’ case the managing authority is the Welsh European Funding Office (WEFO). The purpose of the funds is to invest in creating jobs and a sustainable and healthy economy and environment for Europe. The Welsh European Funding Office (WEFO) is the Welsh Government department that negotiates the terms of the programmes with the European Commission and that manages the approved programmes: approving grants and monitoring performance and compliance. For the period 2014-2020 West Wales and the Valleys (WW&V) qualified again as a ‘lesser developed’ region and has been awarded the highest level of EU grant aid of approximately £1.4bn. East Wales (EW) has been classified as a ‘more developed’ region and will receive approximately £300m. The map below show the geographical area covered by each region. WWV receives more funding and at a higher intervention rate than that EW. 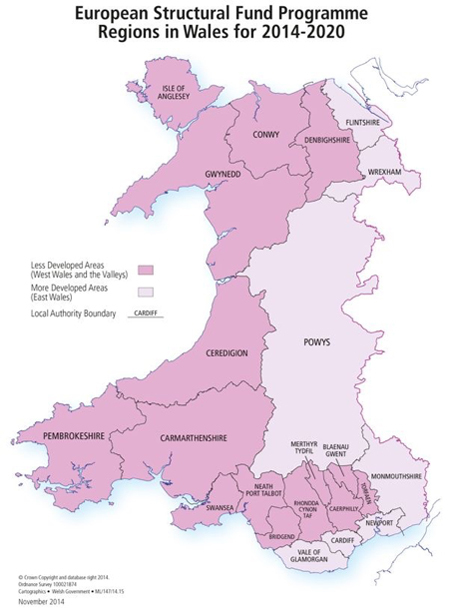 Within South East Wales we have 10 local authority regions comprising six WWV (Blaenau Gwent, Bridgend, Caerphilly, Merthyr Tydfil, RCT, Torfaen) and four EW (Cardiff, Monmouthshire, Newport, Vale of Glamorgan). Parts of Wales, eligibility determined at ward level, will also qualify for funding through the European Agricultural Fund for Rural Development (EAFRD) and the European Maritime and Fisheries Fund (EMFF). The ESI funds, together with match funding will drive a total investment of £3bn across Wales, helping people into work and training, youth employment, business competitiveness, research and innovation, renewable energy and energy efficiency, infrastructure, connectivity and urban and rural development.